Last week I wrote an article about the controversial General Teaching Council of England proposed code of Conduct for teachers. Commentators had protested at what they saw as intrusion into the personal lives of teachers. Furthermore, there was a concern as to who was saying what was and what was not acceptable behaviour and how such a code might be used to suppress ideas seen by authorities as undesirable. Recent events in London show the dangers. As reported in the Guardian newspaper a Special Needs teachers, Adrian Swain, was dismissed a week before Christmas from St Paul’s Way, a comprehensive in Tower Hamlets, east London for refusing to stop wearing clothes which failed the school’s new dress code. What were the offending clothes? Adrian Swain, who teaches Physical Education, came to work wearing track suit bottoms and trainers. There is widespread suspicion that the real reason for sacking Adrian, is because he is secretary of the local teachers union, the National Union of Teachers. The school justification for the enforcement of a dress code is that teachers should not wear anything that the students are not allowed to. And, for non UK readers of this blog, the UK persists in allowing schools to force students to wear school uniforms, even for very young children. When my stepdaughter was 7, I was summonsed to a meeting the her headteacher, who told me that she would no longer be allowed into school if she wore Doctor Martins shoes. The reason for the ban, said the head, was because wearing such shoes was hindering her learning! Commenting on the Swain case, Brian Lightman, former president of the Association of School and College Leaders, said many schools had dress codes for their teachers because staff were role models to their pupils. This begs the question of what sort of roles are being modelled, The sacking of Adrian Swain has no connection to his abilities as a teacher. It is all to do with reinforcing uniformity and maintaining the role of schools as an instrument of control. The proposed Code of Conduct for Teachers is designed for the same purposes. It should be stopped. Alec Couroso has been pondering on the differences between a Personal Learning Environment and a Personal Network. The replies from a Twitter shoutout are interesting. But I am not really convinced. For me the idea of a Personal Learning Environment was never limited to the tools we use for learning or to on-line learning. It is what is says – the environment in which we learn. And that includes work, the home, our social environment and the institutional learning programmes in which we participate. It includes books and above all perhaps it includes people. What distinguishes PLes from VLEs, e-Portfolios, or from classroom and lecture based learning for that matter, is that it brings together informal and formal learning. It recognises the primacy of the learner on driving and developing their learning. And – in terms of tools – it provides them the means to organise their own learning. Whilst I don’t really see the point in distinguishing between a PLN and a PLE there are changes in the ways we are learning and the tools we are using to learn. I still use quite a lot of these tools. But for most of my web based publishing I have moved to WordPress. And I now use Open Office as a work processor. For bookmarking I use diigo. And Vienna is now my newsreader of choice. But these are small changes. What has changed since i produced this list is the development of web based tools for social networking. Facebook has come and almost gone (although more on that in another post). Twitter is a critical part of my PLE. I live on skype and sometimes venture out in Second Life. I regularly facilitate or participate in sessions on Elluminate. But it is not even the advent of new tools but rather chnages in the way we are using the web for learning. So whilst before my PLE comprised of a series of tools for managing learning, for consumption and for creation, and tools for communication – today the communication tools are central in managing my networked and collaborative learning. Web 2.0 tools have allowed us to put the social back into online learning. That for me is why elearning 1.0 never really worked. Learning is a social activity. Early e-learning applications tried to bypass the social. Interaction was with the computer, not with other learners. Personal Learning Networks, Personal Learning Environments – I don’t really mind what we call them. What is critical is that a PLE / PLN helps us in organising our learning and helps us make the connections with those with whom we want to collaborate and share, whoever, wherever they are. An article by Jessica Shepherd in yesterdays Guardian newspaper has drawn the ire of twitter posters today. The article, entitled “Teachers could face sanction for weekend drunkenness”, reported on the new code of conduct being issued by the General Teaching Council for England. The code says teachers could face sanctions if they damage “public trust and confidence” in their profession. According to the Guardian “Keith Bartley, chief executive of the General Teaching Council for England (GTC), the profession’s watchdog, said teachers needed to “consider their place in society”, and act as role models. When asked what the watchdog would do if teachers were drunk and rowdy at the weekend, Bartley said the GTC would look at the individual circumstances before deciding if they should face disciplinary tribunals. Teachers didn’t have to be exemplary citizens every second, Bartley said. Nevertheless, their behaviour could be “lawful but not acceptable”. The code, which comes into force next autumn, states that teachers and trainees must “uphold the law and maintain standards of behaviour, both inside and outside school, that are appropriate given their membership of an important and responsible profession”. They should “demonstrate awareness of their role as a significant figure in the lives of children and young people, lead by example, and model the characteristics they are trying to inspire in young people”. In my view Kate and Leon have raised critcial questions. In proposing to take sanctions againsr teachers for what may be legal activities in their own time, the GTC is setting themselves up as moral judges over teachers’ lives. could sanctions be taken against someone for writing “inappropriate” comments to Twitter? Is a teacher who gets sent off for being involved in a fight in a rugby game to be disciplined? The GTCE are failing teachers. The use of new technologies is blurring the divisions between the public and private. The GTCE should be supporting teachers in dealing with these issues. The proposals are now subject to consultation and hopefully the teachers’ unions will lead the opposition. If you want to follow the discussions on twitters a tag has now been established: #GTCE. 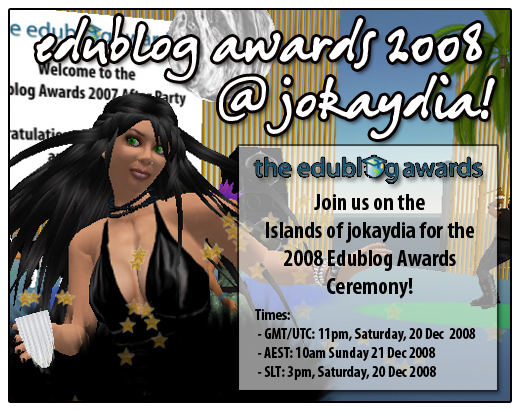 Saturday night (depending on your time zone) the EduBlogs08 award ceremony is being held in Second Life. And since as some of you know Pontydysgu is a distributed organisation and are friends are in many different countries, we’d like to invite you all to join us at the show and after show party for an end of year bash. the ceremony takes palce at 2300 UK time and 2400 Central European Time. The ceremony wil be held on the Islands of Jokaydia with a meetup at the jokaydia Landing point (SLurl) for newbie support and pre-event hot chocolate. The ceremony will be held in the new auditorium (SLurl). It seems there is a limit on the number of visitors but there is an overflow area with chat bridge and audio streaming at the jokaydia Meeting Hall (SLurl) for those who don’t get a seat but would still like to hang out inworld. EdTechTalk will be providing a web-based audio stream of the event which can be accessed at: http://edtechtalk.com/live and there is also a chat room. Meet at jokaydia Beach! (SLurl) for the post event party. Graham Attwell’s inworld name is Graham Lightfoot and Cristina Costa is Kayla Helgerud. We look foward to meeting up with you. (By the way of you haven’t voted yest head over to Edublog awards site. We have the ideas and the technologies – what changes in the system do we need for Open Education? Last week in a post entitled “If PLEs are Incompatible with the System, how do we Change the System?”, I argued that our present systems are unable to keep up with the requirements of society and of industry for learning and knowledge development. Curricula cannot keep pace with the speed of technological and social innovation and the skills and knowledge required by today’s technology cannot be delivered through a rigidly sytematised, market led educational system. Present education systems cannot support lifelong learning and it will cost too much to extend the present model of institutional education to deliver the learning required by the present phase of capitalism.I could – and should – have added that in many countries there is still not free access to basic education – let alone to higher education. Even in advanced economies such as the UK students are expected to contribute towards the cost of their education resulting in many leaving higher education with large debts. There is an assumption that they will do this because of the premium this places on their earning power but research shows this premium to be eroding. And such a premium is based on the differential between them and those without higher education; if everyone has equal access to learning then such additional income would disappear. If the present systems cannot be extended to deliver education for all and lifelong learning is there an alternative? I believe we have an emergent alternative based on the use of new technologies and on radical changes in pedagogy. Lets start with learning materials or educational resources. We are moving from a position of scarcity to one of abundance through the rapid development of Open Educational Resources and internet based media. Books, videos, audio,learning materials, research papers, journals can all be accessed through the internet. Critically the development of cheap sub laptop computers and of handheld devices (plus the soon to emerge, cheap electronic book readers) and increasing access to internet access, provide a wealth of easily accessible educational resources. Such media are socially and economically sustainable through the very numbers of people contributing to their development and publication. There are still issues over quality and discovery but these issues are far from unresolvable. Secondly, social networks allow us a forum and social space for shared and peer group learning. We are no longer dependent on the classroom based expert learning model of the past. Just by following Twitter isit is possible to find every day streamed conferences and seminars with free online access. More importantly teh culture of free and open education is spreading. A number of educational social networking sites allow anyone to offer courses and anyone to attend. Whilst some are based on business models involving fees, it seems more likely we will move in the direction of free online education. Early Open Educational resource sites are increasingly looking at enhancing teaching and learning provision to support the materials they are posting online.But most critically, social networking allows us to find and collaborate with people who share a similar interest – and that can include a similar interest in learning. As early as 1970, Illich put forward a vision that people would send a postcard to a central address expressing there learning interests and that a mainframe computer would match up their interests with others and arrange them a meeting with such people. Now that process can be expidited through online social media and geographical location technologies could allow us to meet up face to face with those people with similar interests in our geographical vicinity. One of the barriers to such self driven and social learning has been centrally controlled and regulated curricula. Here too, the use of social media is leading to new ideas of community driven, emergent curricula based on the model of the Rhizome. Learning will not so much be driven by enrolment on a officially prescribed course or curricula, but in participation in learning as part of a community of practice where bodies and tenets of knowledge are changing, emergent and transparent. Participation in courses and programmes of learning also has a social element. But here too, we have an alternative model. Massive On-line Open Courses (MOOCs) offer a model for the scalable delivery of courses and programmes, and more importantly for the organisation of social interaction around such courses, both online through blogs, wikis, online seminars, internet radio, MUVEs etc. and face to face through geographically located study groups and circles. A further piece in the jigsaw is the move towards Personal Learning Environments. PLEs are important in allowing individuals to organise and manage their own learning, regardless of where that learning takes place. PLEs can provide a framework for scaffolding and reflection on learning. Put all the parts together and we have a new model, a model which can extend learning to all those who want it and support lifelong learning. A model which is affordable and scalable. But of course it requires imagination and change to implement such a model. There are four key changes we need to take. The first is in the role of teachers. Teachers are important for guiding and supporting learning. Teachers are a precious and scarce resource. Too much to their time at present is pent delivery front of the class learning and lecturing. If we could increase social and peer group learning and free up teachers time, then we should be able to provide open access for teachers to all who require such support. The second is assessment. present methods and approaches to assessment are one of the biggest barriers to new and more radical pedagogic approaches. If assessment was seen as part of the learning process, rather than as a process of measuring what people do not know, assessment could become an integral and important part of a new system.If education and learning are integrated in society, then assessment can become authentic within everyday living and working situations. The third is the role of schools and the design of learning environments. The schooling system has become institutionalised. the vast resources used to support and maintain school buildings and facilities could better be used supporting learning within the community. Schools should be opened to learners of all ages providing guidance and support for learning. But schools are not the only place in which we learn. It is widely accepted that much of our learning is informal. Yet we do little to enhance working and community environments to support that learning. The working environment is not juts the physical surrounding but the deign of work tasks and the work organisation. For learning to be effective we need opportunities to put that learning onto action. We need a holistic approahc to learning environments. A positive outcome of deschooling society is to introduce learning in the wider spheres of activity in our societies. The final change is in accreditation. There is little point in developing learning in the workplace and in the community and encouraging the development of Open Educational Resources and Personal Learning environments, if access to future opportunities is reliant on accreditation which can only be obtained through participation in prescribed courses. Accreditation can and should be based on presentation of evidence of learning and competence, based on our e-Portfolios and participation in learning activities. Of course, this may require some forms of presentation, in electronic and other media and may require expert and peer testimonial. This is not so much of a technical change, but a change in how we view the validation and recognition of learning. Of course these are radical chnages. But the main point of this post was to say that we have the ideas and the technologies to support an alternative to the present education systems, systems which are failing so many indiviidals and failing society as a whole. I have spent most of the day working on the Mature project. The project, funded by the European Commission, is developing services for knowledge maturing in organisations, including the introduction of Personal Learning and Management Systems and Organisational Learning and Management Systems. Of course, before we can develop or implement such systems we have to work out what they are. For me that is half of the attraction of the project. This morning we had an on-line meeting for one of the work groups, this afternoon I had a long talk with Tobias Nelker from Paderborn University and in-between I started writing up overdue reports. here are just a few thoughts following our discussions. One of the attractions of the project, which is relatively well funded, it it brings together an interdisciplinary research team including researchers from sociology, computer sciences, education and work sciences. We are struggling still to find a common language. sometimes I do not understand what the computer scientists are talking about – and I am quite sure they have similar problems with me. More problematic is the development of a shared research approach and methodology for the project – different disciplines have different approaches to similar issues. We need to find ways of using this as a strength for the project. With reference to knowledge sharing, I think we have some tensions between those who view knowledge through artefacts and others of us who see knowledge development and maturing as a process. I am by no means convinced we can measure or even understand knowledge maturing in the progressive iteration of a document or artefact – to me it is the social use of such artefacts which matures. The project is through the technology programme of the European Commission and oart of the work involves the development and testing of tools. There seem to be two tensions. How can we marry together research into how people learn and how knowledge is developed with actual practice within organisations? And how can we design tools which help people in their everyday work and lives based on their practice – rather than saying – here is a cool wizzy tool which we would like you to try out. I am increasingly aware of the importance of context in learning and in knowledge development – especially in work based learning and in informal learning. there are multiple contextual variables of which I feel the most important is work organisation. It is not only an issue of opportunities for learning but an issue of the autonomy to use such learning in practice. This cannot be reduced to merely adopting to the work environment but the ability to shape that work environment based on individual and collective or organsiation knowledge. This in turn requires change processes. But any project such as Mature is acting as a change agent in the very processes it studies. All in all this is complex. But I am convinced that we can use technology based tools to open opportunities and support learning in the workplace – not just to courses – but for individual and peerr group learning from everyday working experience. This can not only lead to individual learning but can enrich work environments and lead to enhanced quality of goods and services. And in many ways I think this may be the real impact and potential of what we have called e-learning – rather than trying to use technology to implement traditional classroom based learning at a distance. NB I am increasingly convinced of the potential of microblogging systems for knowledge exchange and development. This was what I taled to Tobias about this afternoon. Will write something more on this over the weekend. If PLEs are incompatible with the system then how do we change the system? Goerge Siemens has written an important post called ‘Systematization of education: Room for PLEs?’ Why do I think it is important? Because George tries to look at the relationship between the development and uses of technology and the societal organisation of education. He concludes: “Education has ceased to be about the individual learner (the early university model) to being about the existing power allocation of society (today’s model as a by product of industrial techniques applied to education). I agree with almost everything George says. But I am far less pessimist than him. I think George misses two things: the inherent contradictions in capitalist societies and the power of individual and collective agency. Just as there are contradictions in the capitalist economic system, so are there in the different superstructures which support that system. Yes, education has become systematised to deliver the education and training required by modern industrial societies. But at the same time, the system is unable to keep up with what is required. It is not just a question that curricula cannot keep pace with the speed of technological and social innovation. It is an issue that the skills and knowledge required by today’s technology cannot be delivered through a rigidly sytematised, market led educational system. Furthermore, globalisation, the rapid turnover in employment and occupations and the implementation of new technologies have led to pressures for continuing learning – what is being called lifelong learning. Present education systems cannot deliver this. Hence the never ending reforms of our schooling systems and the ongoing financial problems of universities. Putting it simply, it will cost too much to extend the present model of institutional education to deliver the learning required by the present phase of capitalism. PLEs and MOOCs offer alternative models – for better or worse. Although institutions may resist such models, they will have little alternative than to embrace change. It is not merely a question that the system has to change before we can adopt Personal Learning Environments. PLEs support informal and social learning. It is that informal and social learning which can change the system. 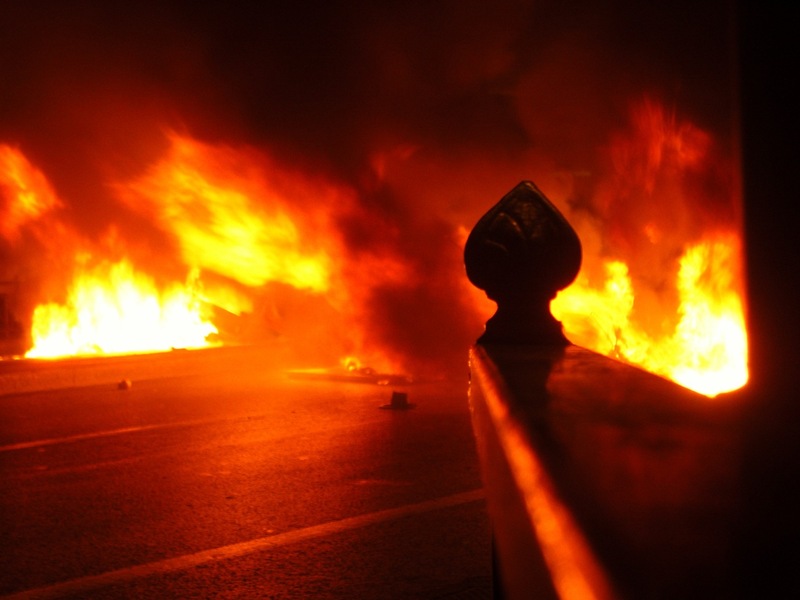 It is notable that the uprising in Greece is being led by students – many of whom are still at school. We all can have agency in changing the system and the use of social software and the development of peer networks is part of that process. We are proud to post this story by our friend and colleague, Maria Perifanou from Thessaloniki. “Athens, 6/12/09 …a 15 years student is dead…a police officer killed Alexandros Grigoropoulos without any reason at all! As witnesses sustain it was a direct hit but the officer who fired contends it was a ricochet from a warning shot . The question raised is how this can be happen in the birth land of democracy in 2008? ?‘There is no excuse’…’we will take revenge’ ‘state has forgotten us’ are some of the messages students left at the place where the boy died…. Greece is mourning, students protest, we all do but there is another side too!! There are people who destroy, steal and burn everything! These are no students, are no people with ideologies but they are people desperate who have nothing to loose. They scream NO to this inequality and injustice! There is a serious social and economical crisis! The answer is not violence but well organised protests!! Students show that they are here, they understand, they fight they want to change this bad situation, they have VOICE!! In democracy there are no dead ends, no anger only dialogue and will to do changes! The solution will be given by the nation, by each of us! We must fight for a better future. New generation rebel and their message is clear PROTEST FOR DEMOCRACY AND RADICAL CHANGES WITH NO VANDALISMS!! Fabulous internet radio broadcast from the Online Educa Berlin conference. Don’t miss interviews with people from the Moose project, Ton Zijlstra, Jean Miller from Linden Labs, Hank Horkoff from China Pod, Heike Philp and many, many more. Full programme listings to follow. Many thanks to all who helped on the programme especially our technical team, Joe and Dirk and Cristina who ran the chatroom.